Cardiac surgical procedures are among the most common and most complicated forms of surgery worldwide and the postoperative period is characterized by complex challenges. Among the factors determining ultimate clinical outcome, postoperative critical care is of major importance. This book adopts a clinical approach in explaining and analyzing the course of clinical care in patients undergoing cardiac surgery. 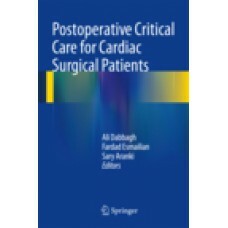 Since the postoperative clinical status is directly influenced by preoperative and intraoperative factors, the early chapters briefly examine preoperative issues and the intraoperative course of cardiac surgery, with particular attention to anesthesia and the process of cardiopulmonary bypass. Subsequent chapters primarily address the critical care of patients by means of an organ-oriented approach, which will enable the reader to use the text as a "cookbook" of cardiac intensive care. This book is intended for use in daily practice by cardiac surgeons, cardiac anesthesiologists, intensivists and cardiac intensive care nurses. Synopsis of Cardiac Physiology.- Cardiac Pathophysiology.- Cardiovascular Pharmacology.- Cardiovascular Monitoring.- Central Nervous System Monitoring.- Coagulation Monitoring.- Risk and Outcome Assessments.- Cardiac Anesthesia.- Cardiopulmonary Bypass and its Effects.- Myocardial Protection and its Effects.- Respiratory Management.- Cardiovascular Management.- CNS Management.- Coagulation and Postoperative Bleeding.- Fluid and Electrolyte Management.- Management of the Other Systems.- Long Term Complications Postoperative care in Pediatric Cardiac Surgeries.